Nadine will graduate from the Department of Occupational Science & Occupational Therapy this coming November. During her undergraduate years, Nadine helped to found the University of Toronto Global Brigades (UTGB), a student-led chapter of an organization called Global Brigades. She first served as its president, then as campus chairperson while a graduate student. University of Toronto Global Brigades (UTGB) works to improve quality of life in Central American and Ghanaian communities, in a manner that is sustainable and promotes community self-sufficiency. The organization empowers communities to meet their health and economic goals through various programs (business, dentistry, engineering, environmental, human rights, medical, public health and water). 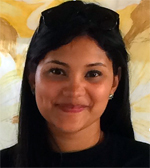 Nadine has been volunteering with Global Brigades since 2013 in the medical/dental programs in Honduras. After seeing the high level of health needs in rural areas, she organized a rehab brigade with support from Global Brigades and her professor Debra Cameron. The medical/dental brigade, in collaboration with a Canadian allied health team, set up a mobile health clinic in the community of El Tablon, Honduras. The clinic’s team included 36 students from University of Toronto and Carleton University, occupational and physical therapists and assistants, speech language pathologists, local doctors, dentists and pharmacists, and provided care to more than 1000 patients in 4 days. Patients at the clinic varied in age from babies to older adults, and had a variety of conditions, including arthritis, fractures, swallowing difficulties, speech impairments, neurological conditions, early childhood learning difficulties and soft tissue injuries. As a member of the allied health team, Nadine also participated in the first Community Health Worker Conference, and helped to develop a workbook for CHWs. Nadine hopes to continue the work she has begun with Global Brigades to help develop sustainable health solutions as communities work towards becoming holistic. This entry was posted on September 9, 2016 by tmyerscough.